The Cyrkle perform "Turn Down Day" on The Hollywood Palace. Due to overwhelming demand, two more shows have been added to The Monkees' UK Tour. Also announced today is that Lulu will be The Monkees' opening act for these performances. Top debuts this week include "Sunshine Girl" by The Parade, new on the chart at #72, "My Girl Josephine" by Jerry Jaye, a great remake of an old Fats Domino tune, in at #82 ... this was my first exposure to this songs and I absolutely LOVED it ... "Groovin'" by The Young Rascals, premiering at #91 (and soon to be a '60's summer classic), "I Was Kaiser Bill's Batman", an instrumental novelty hit by Whistling Jack Smith (#94), a new track by The Seeds, "Can't Seem To Make You Mine" (#95) and a premier by our FH Buddy Davie Allan who enters the chart at #96 with his latest, "Blue's Theme". Producer Chip Douglas believes in it, too, and convinces his old band The Turtles to have a crack at it. Their single is finally released in June of 1968 and ultimately peaks at #36 on the national charts. 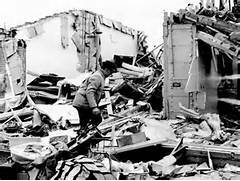 Locally a series of SEVENTEEN tornadoes rip thru the Chicago area, killing 33 and injuring over 500, causing upwards of $50 million in damages. 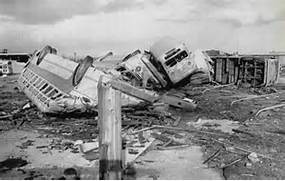 I remember driving thru Oak Lawn with my parents a few days later to view the damage. After defecting from The Soviet Union back on March 6th, Joseph Stalin's only daughter, Svetlana Alliluyeva, finally arrives in the United States seeking political asylum. (She first approached the United States Embassy in New Delhi, India, and stated her desire to defect in writing. US Ambassador Chester Bowles offered her political asylum and a new life in The United States. Fearing repercussions from The Soviet Union, the Embassy sent her to Rome. From Rome she was sent immediately to a six week tour of Switzerland prior to coming to The United States.) When she arrived in New York City on April 21, 1967, she denounced both her father and The Soviet Union during a prearranged press conference. 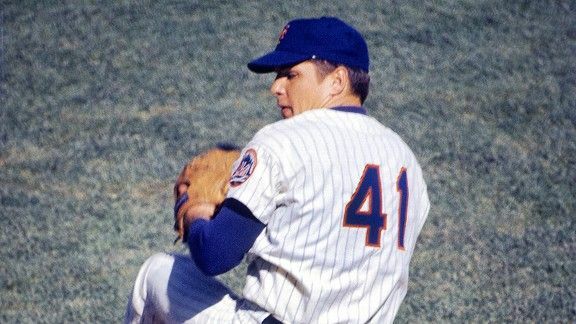 Baseball pitching great Tom Seaver of The New York Mets earns his first major league victory over The Chicago Cubs, 6-1. Seaver will later pitch for the crosstown Chicago White Sox. In 1977 he moved to The Cincinnati Reds (where he stayed through 1982) ... and then he was back with The Mets for a season in 1983 before joining our Chicago White Sox for three seasons (1984 - 1986) for his first of three million dollar-plus salary seasons. He's also a twelve-time All Star and, without question, one of the most highly respected pitchers in Major League History. We did a big salute to 1969 on the website back in 2014 ... not quite as elaborate as our 1967 Series ... but we still covered a lot of ground. Scroll around that general area and you'll some of our other 1969 features, too! 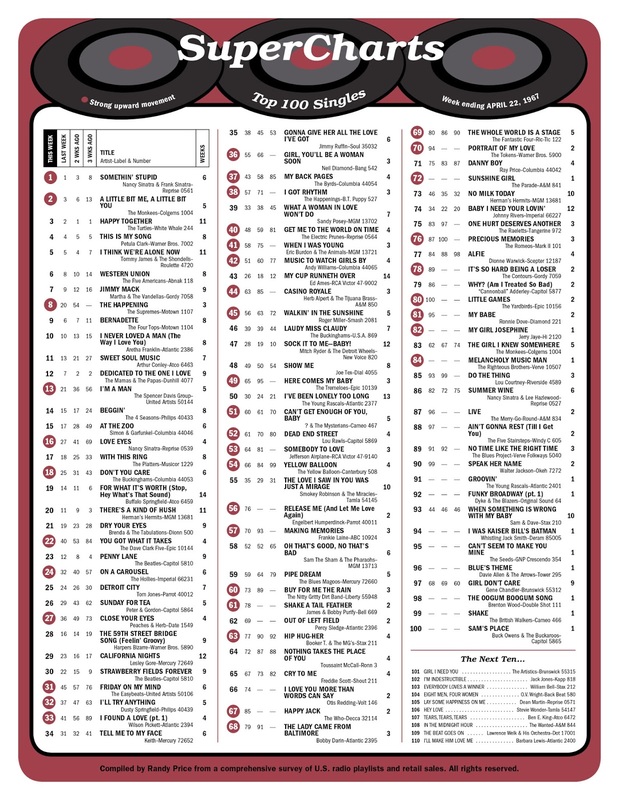 Other bulleted movers on this week's chart include "Music To Watch Girls By" by Andy Williams (up to #42 from #51), "Casino Royale" by Herb Alpert and the Tijuana Brass (now sitting at #44, up from #63), "Walkin' In The Sunshine" by Roger Miller (up to #45 from #56), "Here Comes My Baby" by The Tremeloes climbs from #65 to #49 and Engelbert Humperdinck seems poised to run up the American Charts just as he did back home in Great Britain as "Release Me" jumps from #76 to #56, a move of twenty places. James and Bobby Purify are up 17 spots from #78 to #61 with "Shake A Tail Feather", Booker T. and the MG's move from #77 to #63 with "Hip Hug-Her", and The Who make a big move with their latest as "Happy Jack" climbs from #85 to #67. Lower down the chart The Yardbirds also make a twenty point jump as "Little Games" climbs from #100 to #80. 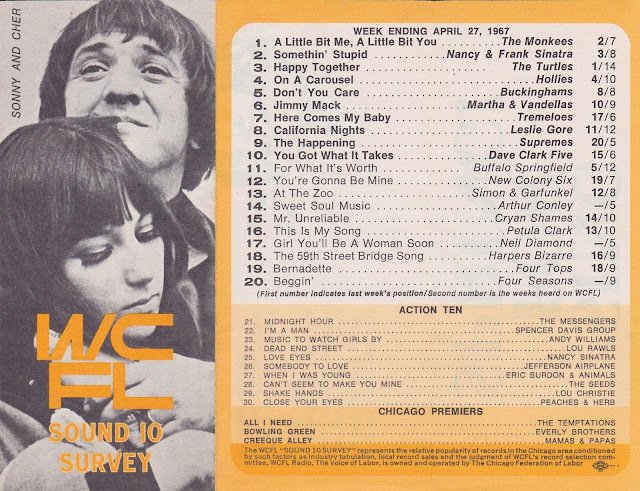 The Monkees hold on to the #1 Spot on the WLS Silver Dollar Survey ... and now move up to that position on the WCFL Sound 10 Survey, too. First, we find The Buckinghams at #5 with "Don't You Care", "Mr. Unreliable" by The Cryan' Shames is at #7, "You're Gonna Be Mine" by The New Colony Six sits at #8, Michael and the Messengers (from just across the Wisconsin border) holds down the #16 spot with their version of "In The Midnight Hour", The Riddles are at #19 with "Sweets For My Sweet" and Lou Rawls can be found at #24 with "Dead End Street". Nancy and Frank Sinatra hold The Monkees off for at least one more week as "Somethin' Stupid" maintains its #1 position on top of our Pop Super Chart for the week ending April 22nd. The Monkees' "A Little Bit Me, A Little Bit You" still manages to creep up a notch to #2, followed by The Turtles at #3 with their former #1 Hit, "Happy Together" Meanwhile, The Supremes make the biggest leap into The Top Ten as their latest, "The Happening" jumps all the way from #20 to #8. "I'm A Man" by The Spencer Davis Group climbs eight notches from #21 to #13, "Love Eyes" by Nancy Sinatra is up to #16 from #27 and The Buckinghams manage to crack The Top 20 with "Don't You Care", up from #25 from the week before. The Dave Clark Five continue to make impressive inroads as "You Got What It Takes" climbs 18 spaces from #40 to #22. "Friday On My Mind" by The Easybeats is up to #31 from #45, a move of 14 places and Neil Diamond's latest, "Girl, You'll Be A Woman Soon" jumps nearly twenty places from #55 to #36. "I Got Rhythm" by The Happenings seems to be a bonafide hit, rising from #57 to #38 … and Eric Burdon and the Animals are up 17 spots from #58 to #41 with their latest, "When I Was Young", falling just outside The Top 40. 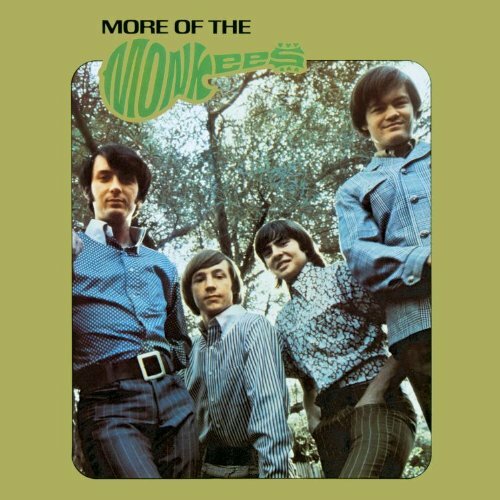 It's The Monkees again with the #1 Album in the nation … "More Of The Monkees". 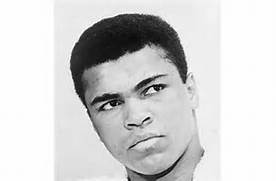 The US Supreme Court denies Muhammad Ali's request to be exempt from Army induction as a conscientious objector. Filming wraps up on "Clambake", a very long, tedious venture which later opens to very dismal results. 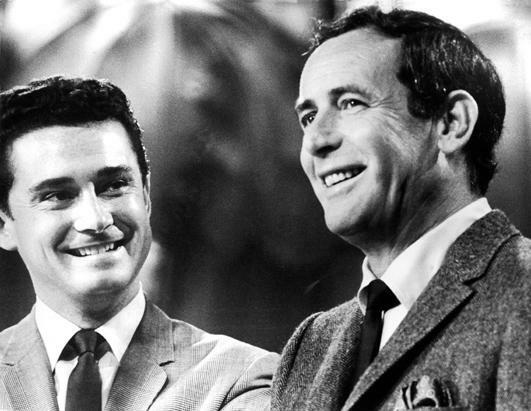 "The Joey Bishop Show" premiers on ABC in direct competition against "The Tonight Show" featuring Johnny Carson. Despite a wide variety of guests (and several appearances by members of the so-called Rat Pack) it never bested Carson in the ratings … and was cancelled two years later. BTW, Joey's sidekick announcer was none other than a young Regis Philbin. Nancy Sinatra performs "Love Eyes" on The Ed Sullivan Show … and is then joined by Producer Lee Hazlewood to perform their hot new duet, "Summer Wine". Tony Bennett also appears on this evening's program and performs "The Sunny Side Of The Street," "I Left My Heart In San Francisco," "Don't Get Around Much Any More" and "The Lady's In Love With You" with The Count Basie Orchestra. The Electric Prunes perform on The Smothers Brothers Comedy Hour.